Fictional yet amazingly technically accurate dramatization, not to be done in real life. We assume no responsibility and deny everything. While staying at an inexpensive but clean hotel, I noticed this little box attached to the wall, which the air conditioner power cord was pluged into. It had a little flashing LED. I first thought it might be a power line filter or one of those 'watt-misers' (watt misers are a good thing, I use an "Energy Smart" brand one on my refridgerator), but upon closer inspection, I found a photocell and what looked like a wire antenna. Not being excited about the possibility of having my air conditioning being controlled 'for my own good', or the possibility of being spied upon, I was compelled to investigate. 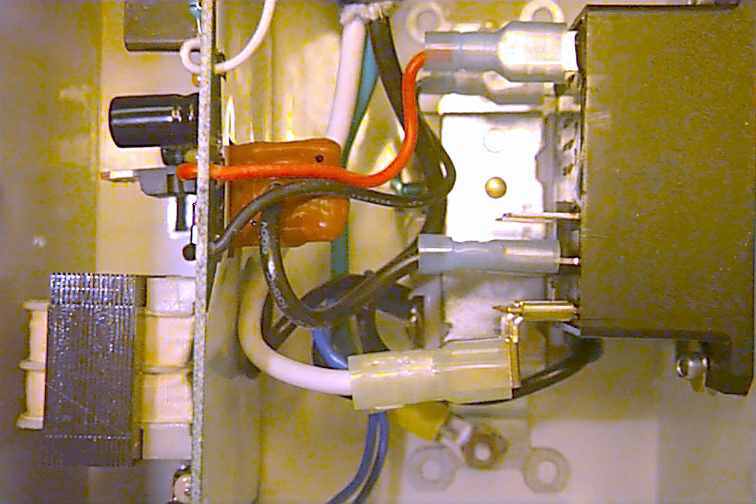 Inspection of the box revealed that there was indeed a relay to shut off power to the air conditioner, as well as a circuit board which had a photocell, a small flexible pc board which came out the bottom with an LM34D IC (temperature sensor) on it, and indeed, an antenna. One wire from the air conditioner power circuit passed through what looks like a brown colored current transformer. Two crystals on the board are 39.150 MHz and 10.15 MHz. Other IC's are LM339N, NE615N, LM324, and an ASIC or similar device. There is also an RJ11 jack, which would seem to be a programming interface, probably a serial port. I was unable to investigate this. 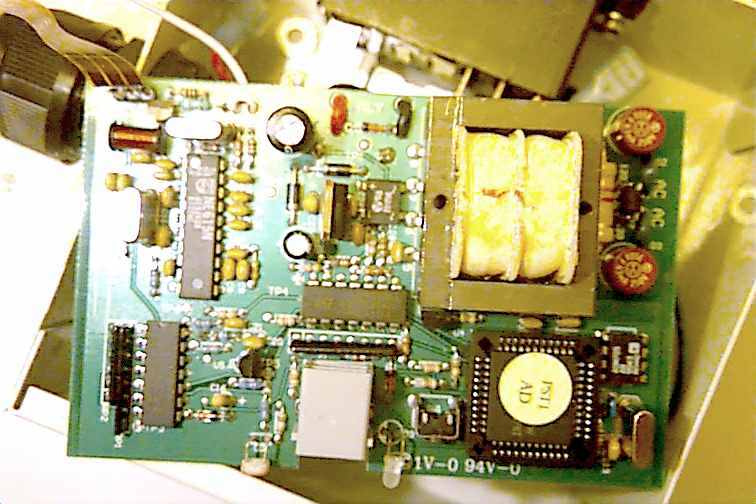 The antenna wire goes to the area of the board with the NE615N, and there is also a coil there, suggesting a radio. I suggest that the 10MHz crystal runs the logic, and the 39MHz crystal runs the radio. The question, of whether it transmits or not, is a good one. The presence of a current transformer, a device which generates a signal when power is being drawn, indicates that the unit knows whether the A/C is on or off. This could be used for data reporting in a scenario where the unit is capable of transmitting, or merely for providing input to the economizing logic where the unit is just a fancy energy saver. Personally, I don't think it transmits. The prevailing suspicion is that the box has an ID which is set up by the RJ11 connection at install time. The property manager then turns on or off air conditioners, by radio, based upon room occupancy. The photocell may be used to sense when the lights are out. such as when the occupant is sleeping or has left the room, and cut off the air conditioner when the temperature is below a set point, providing a higher but more energy-saving temperature setting than the user has set on the air conditioner's control panel. I can see why the hotel management would want to make sure that the A/C was off or minimal when the room was not being rented, but I would strongly disagree with any practice that would interfere with my coming back to a nice cool room after a hard day's work, as well as anything that would cut off the A/C at night. I like it cold when I sleep, and I am paying for the room in any case. I am entitled to all comfort services unless notified in advance. Aren't you? In any case, the device was carefully reassembled and put back. It was not my property, so I took great care to leave it as found. My policy- never damage anything! 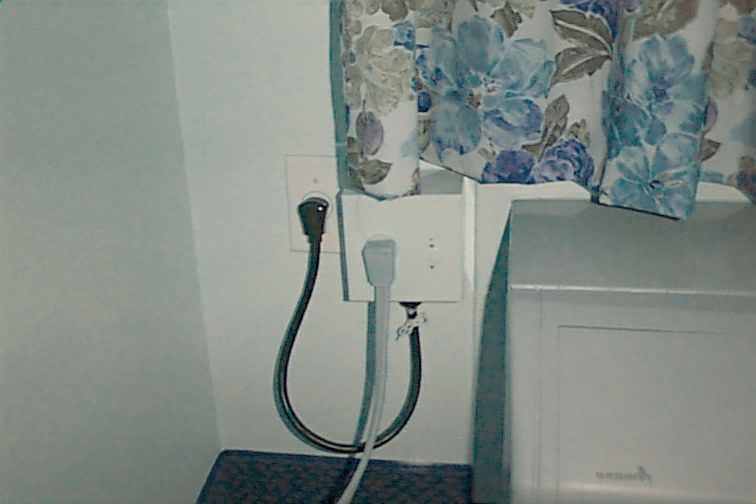 To avoid subjection to this sort of device, just unplug it from the wall, plug it into itself (so the housekeeping won't notice the empty plug ) and plug the A/C right into the wall. When your stay is over, plug things back in the way they were. Note to sweaty hackers: You know if you break this thing you are gonna have to pay for it. So don't go fiddling with it. The best thing to do is to call the front desk and ask them to set the temperature lower. If they have no clue what the hell you are talking about (as in this case) Just leave it alone and plug the a/c into the wall till your stay is over. Note to hotels: I don't advocate anyone damaging your equipment. 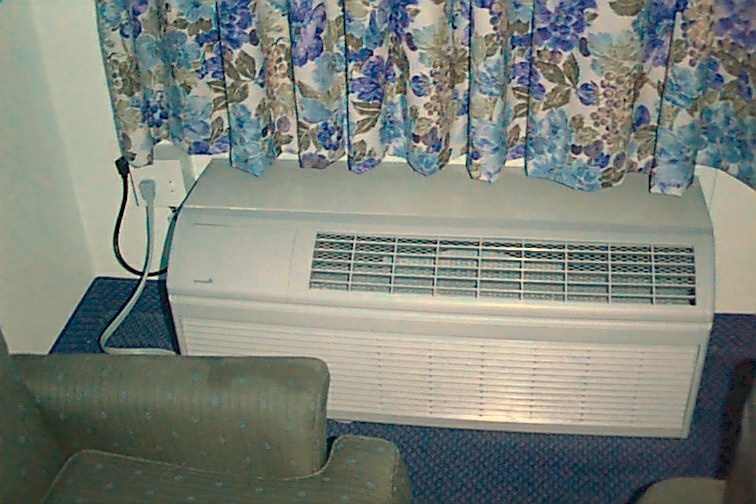 You need to understand that people who are paying $120 per night for a room with air conditioning expect to have control over the temperature, and not have it sneakily cut off when they go out for business or have it set to 78 degrees in the middle of the night. This stuff is controlled by a computer, probably in a closet somewhere. If you don't have priveleges on that computer, get them, so that if someone complains it's 76 in their room and they prefer 70, you will be in a position to provide service to your customers. And no more hate mail you pompous poppinjays! It's not my educational article, and Mr. Zool is deceased. In a room with a motion detector, that is a little cloudy-white 'eye' either built into the thermostat or mounted elsewhere, the a/c may cut back to an uncomfortable temperature when no motion is detected for a time. This happened to me. I could get it to cut back on by rising from my chair. The detector saw this and turned tha temperature back to a normal 70 degrees. To sleep in the comfort that I had already paid for, I took some thumb tacks and some 6 FT strips of toilet paper and tacked them to the ceiling about 2 FT from the thermostat's evil eye. The breeze from the A/C made the toilet paper waft back and forth, which kept the thing activated. In the morning, everyone else was complaining about the wretched A/C that had cut off in the night leaving them to awaken in a pool of sweat at 2 AM. I was pleased to report to my friends that I had not experienced any such problem and told them what I had done to correct the issue. The next morning there were no complaints. We got to stay on top of these issues. In the room I was in, the thermostat would set to 70, but the room would not cool below 74. The 'stat said 70 but the A/C cut off. It is known that many thermostats sold to hotels have the capability to display a low 'set temp' to the paying guest but not allow the temperature to reach that point. It is also known that the same thermostats have the ability to display a temperature that is not the truthful temperature that the paying guest has programmed. These kinds of lying thermostats are a bad thing. I found a way to get around this issue without messing with anything. I got a 120V power cord and attached it to a 1500 Ohm 20 watt resistor. When plugged in, the resistor converts 10 watts of electricity into heat. The resistor was selected to be about 7" long. It gets pretty warm, maybe 130 degrees. I hang the contraption right under the thermostat so that the heat from the resistor rises up into and around the thermostat. To hang it, I use a couple of "clip leads" as the 'string' so the length is adjustable to fit any thermostat. The physical size of the resistor is important so that it is as long as the underside of the thermostat. This makes the dishonest and cheating instrument think it is much hotter in the room, and therefore the A/C will run as much as you want. It seems perfectly safe. It imagine a couple of 7W night lights (bulb type) would produce the necessary heat, for those that prefer not to make ther own electrical equipment. Normally I would agree with hoteliers about how they want to run things and say this hackery is wrong, but not in this case. I am in hotels weekly for business and it is sometimes not comfortable as at home. These measures would not be justified if we could only get the a/c we pay for in a hotel, but we don't get what we paid for. Some hotels are cheaping out on our comfort to save a few pennies. And it is pennies. I know because I work for a power company and I know what commercial properties pay for electricity. If the A/C takes 2000 watts (a very large one indeed!) and electrical cost is 10 cents a kilowatt-hour, then it is 20 cents an hour to run it full blast. 10 hours is 2 dollars. So, if they think you should sweat all night so they can save $2, why don't they just charge $2 more and let the paying customer decide what to do.